You've discovered an igloo where a polar bear and baby polar bear are roaming in search of food. This awesome base has a redstone torch, cozy bed, crafting table and a furnace. 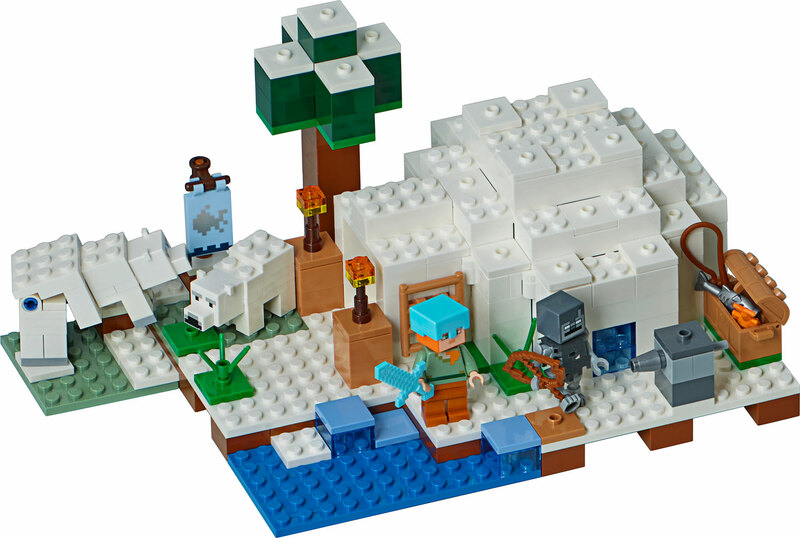 Grab your fishing rod and catch some dinner from the ocean, then use your LEGO Minecraft building skills to create an arrow dispenser to help guard against the stray that's lurking in the icy, snow-covered landscape. 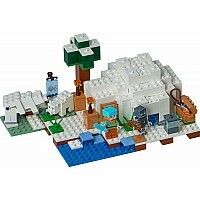 Includes an Alex LEGO Minecraft minifigure, plus stray, polar bear and baby polar bear figures. Remove the igloo roof to access the detailed interior featuring a buildable redstone torch, bed, crafting table and furnace. Grab your diamond sword and defend the Polar Igloo. Build an arrow dispenser and launch the flick missiles to defend against the stray. Check out the polar bear that can stand on its back legs! Accessory elements include a fishing rod, 2 fish, ladder and a chest. Set your imagination free - rebuild the set for more LEGO Minecraft creations! This toy for boys and girls includes over 275 pieces and is suitable for ages 8+. Measures over 4" (11cm) high, 6" (16cm) wide and 9" (24cm) deep.